We do not expect the code to be truly competitive with (especially the latest versions of) MPI in production applications. Still, such experiment may be valuable for people from the Big Data world, who use/code (often computationally demanding) e.g. machine-learning algorithms without experience with HPC, especially with established concepts like efficient tensor contractions, etc. The choice of the implementation target, the aforementioned “basic” quantum chemistry methods, results from the professional background of the project mentor and certainly is a subject of negotiation. Any HPC application with non-negligible data flow is acceptable as well. The plan is to write the Spark code in Scala language (functional/object oriented language, similar to Java). 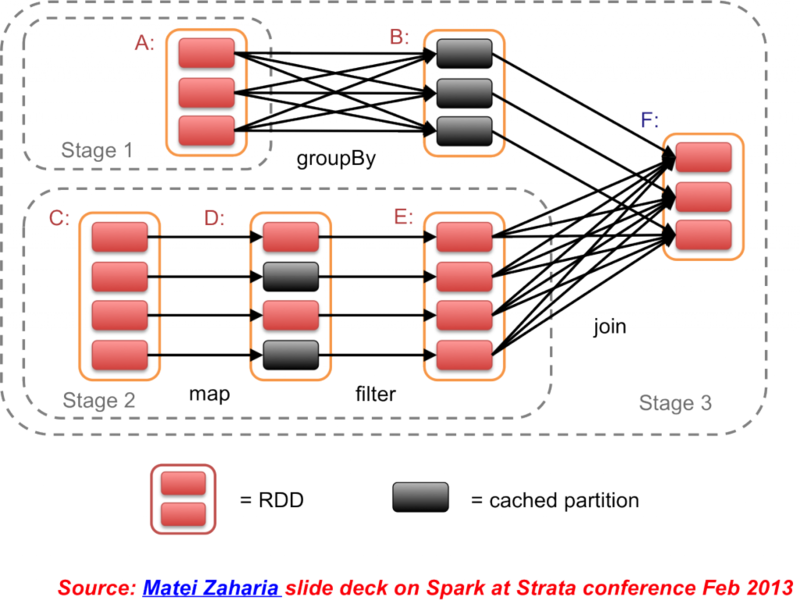 Directed Acyclic Graph of transformations of RDDs (Resilient Distributed Dataset) in Spark program execution. Project Mentor: Doc. Mgr. Michal Pitoňák, PhD. Student will familiarize himself with Scala programming language, Apache Spark as well as with ideas of efficient implementation of tensor-contraction based HPC applications, particularly in quantum chemistry. Basic knowledge of Scala or advanced knowledge of Java. Background in quantum-chemistry or physics. Advanced knowledge of Scala, basic knowledge of Apache Spark, BLAS libraries and other HPC tools, knowledge of C/C++. We believe the resulting codes will be capable of successfully completing (e.g. quantum-chemistry) calculations with on-the-fly crashing/failing compute nodes. What may be interesting about this project from the outreach/dissemination perspective is bridging HPC and Big Data worlds. We do not expect it will directly lead to visually appealing outputs, but we will try to produce some (molecules, orbitals, execution graphs, etc.). The goal is to push the efficiency of the Spark code(s) to maximum, which is by itself “infinitely difficult”. We plan to start with basic quantum chemistry methods, but we can go to more advanced ones (e.g. coupled-clusters). Student must have access to (multimode) Apache Spark cluster. We at CC SAS have IBM BigInsights software package offering this functionality installed on IBM P755 infiniband cluster with GPFS parallel filesystem. 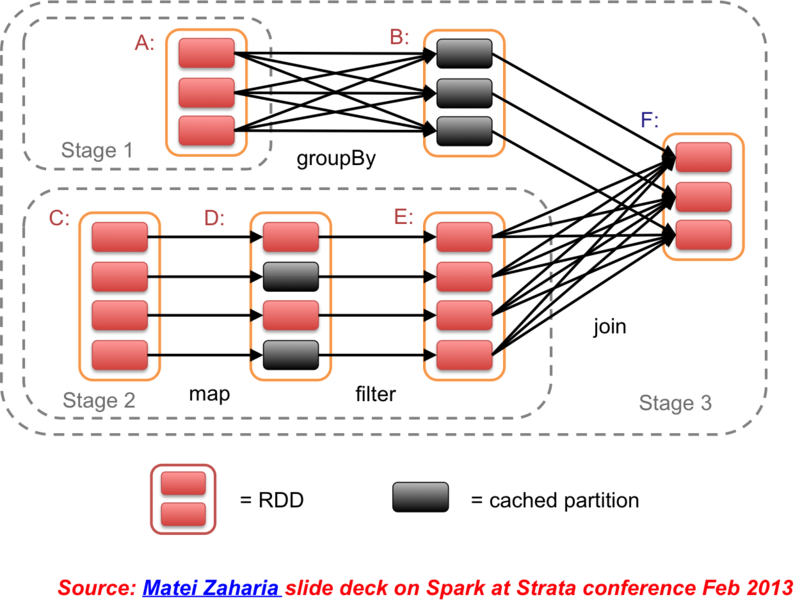 Apache Spark is open-source project and is accessible and easy to install on any commodity hardware cluster. How is your project progress now, can you share with me, please?